First, state attorney general Martha Coakley and Sen. Scott Brown, now Mayor Thomas M. Menino? 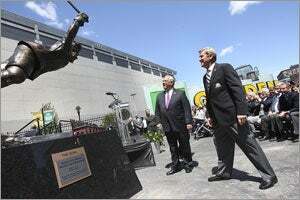 During the unveiling of a new statue depicting Boston Bruins legend Bobby Orr’s “The Goal” on Causeway Street in front of the TD Garden, Menino managed to steal some of the buzz from Orr by first jumbling his words, then mixing in the wrong name for one of Boston’s greatest sports moments. Menino was talking about great athletic feats in Boston history, and called them “ionic” moments (see the :35 second mark). He hailed Orr’s goal, Doug Flutie’s Hail Mary, John Havlicek’s steal and lastly, Jason Varitek splitting the uprights (see the :44 second mark). Wait, that last one’s not right. What Mayor Menino meant to say was kicker Adam Vinatieri’s name. Vinatieri booted the game-winning 48-yard field goal in 2002 to help the New England Patriots beat the St. Louis Rams in the Super Bowl, 20-17, as time expired. The estimated crowd of 500 people and assembled spectators grumbled after hearing Varitek’s name. The gaffe is reminiscent of when Martha Coakley, then campaigning for senator, said Curt Schilling was a New York Yankees fan, and last month when Sen. Brown, when asked about the Bruins and Sabres playoff series in the first round of the NHL playoffs, asked reporters if the Sabres were a Washington team. The Sabres hail from Buffalo and Schilling helped the Red Sox to World Series titles in 2004 and 2007. We’re awaiting a call back from the mayor’s office with his response, if any, to the gaffe.